On Scene: Sale Alert! All Gloves 10% off! Sale Alert! All Gloves 10% off! Right now, using Promo Code: GLOVEME will get you 10% off ALL gloves on our website! We're talking Structural Fire Gloves like those made by the big brands like Shelby, Pro-Tech 8, and Honeywell. We've got your Extrication gloves, including brands you know and trust, like Ringers. Heck, we even have disposable gloves on sale, sold in boxes, great for on the scene, doctors offices, on the ambulance, or in childcare facilities--all 10% off. Need Rope Rescue gloves or Industrial gloves ? We've got you covered. They're part of this hot deal, too. With designs that not only look great, but feel great and protect great, too--you'll love what you'll find here. 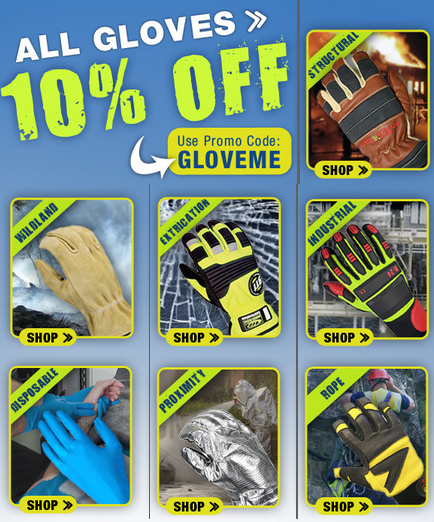 So no matter what job you need your hands protected for, get your gloves 10% off while this deal is going on. Use Promo Code GLOVEME at checkout for 10% off, today!